NREL’s detention pond covers more than five acres, can detain more than 3 million gallons of storm water, is a habitat for migratory birds, sees regular visits from deer as well as the occasional coyote and red fox, and includes a looped trail that is one-third of a mile long and an enjoyable amenity to the NREL staff. 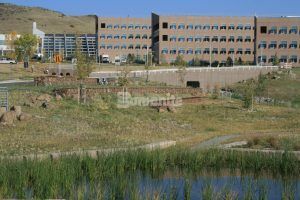 The NREL, National Renewable Energy Laboratory, located in the foothills just west of Denver, is a unique government complex whose focus is to seek creative answers to today’s energy challenges in the venue of a living environmental laboratory. 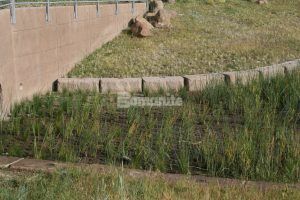 To test improvements to the detention pond structures on campus, NREL incorporated an eco-friendly pervious concrete system called Grasscrete, installed by the local Bomanite Licensee, Colorado Hardscapes. This installation checks off all the boxes of self-sustainability, low-maintenance, environmental aesthetics, durability, and functionality. 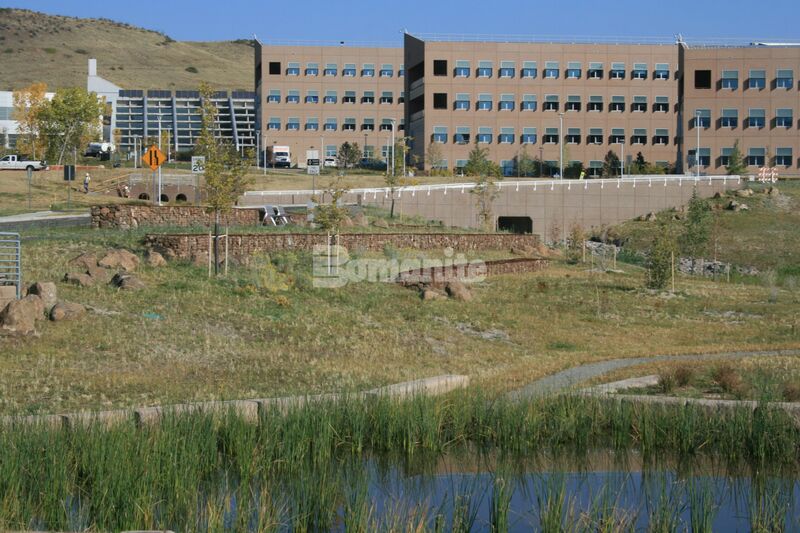 Approximately 10,000 square feet of Grasscrete pervious concrete performs the real purpose of the NREL’s Central Arroyo Detention Pond which is to handle storm and snow runoff by reducing flows, trapping sediment and debris, and maintaining predevelopment hydrologic conditions. Grasscrete is a patented cast-in-place, monolithic, continuously #4 rebar reinforced system of molded pulp formers that create voids. 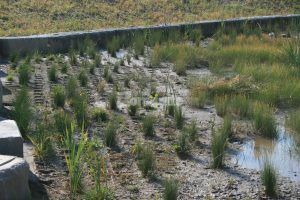 In this case, native wetland vegetation was planted into the voids which allowed the root systems to form below the surface of the concrete. Grasscrete formers are designed for a 5 1/2-inch thick concrete pan and because of that thickness and the rebar, creates an incredibly strong slab. 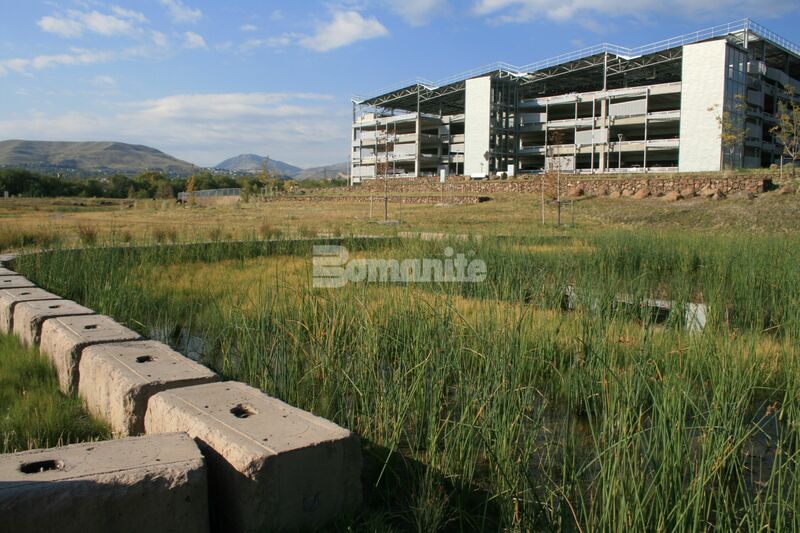 Overtime, sediment builds up to an unacceptable level, and the pond needs to be scraped involving heavy equipment and bulldozers, which, without the use of Grasscrete, would destroy all existing vegetation and the pond would have to be replanted in its entirety. 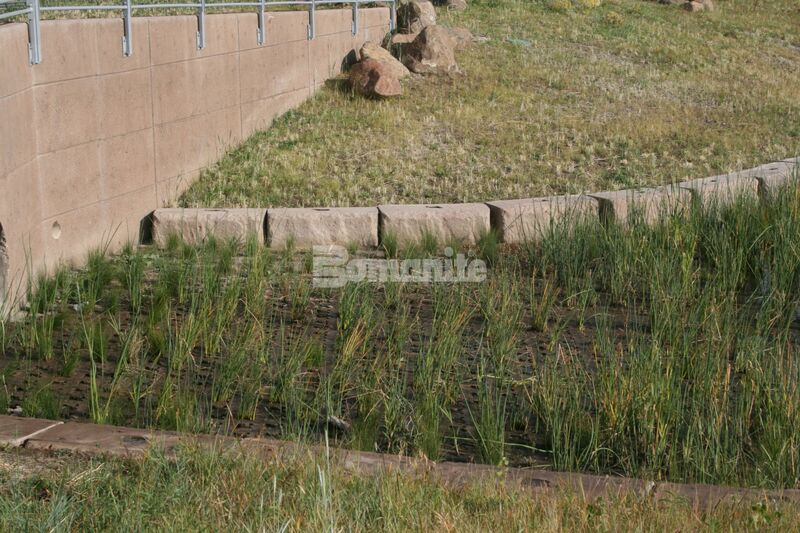 With Grasscrete, they can scrape down to the concrete surface and the root structures remain intact. 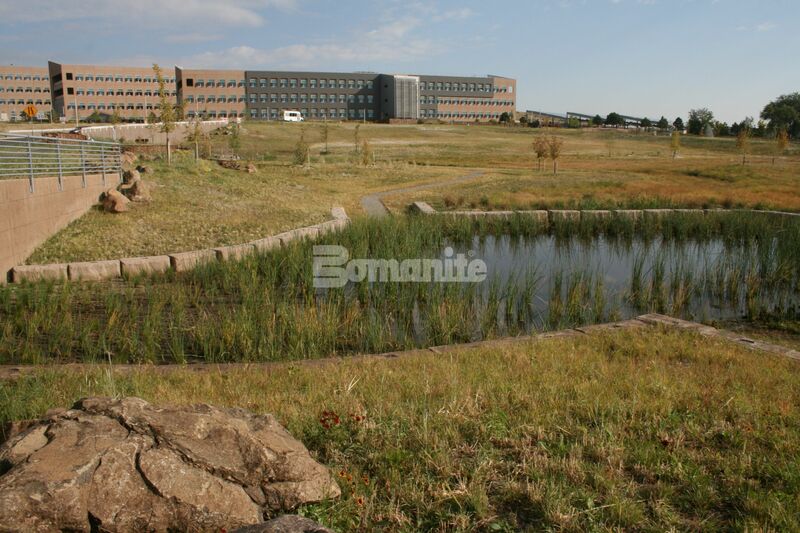 This allows the pond to quickly regenerate without the need of new plantings. Grasscrete allows the integrity of the pond to easily be maintained with routes of ingress and egress for heavy equipment. 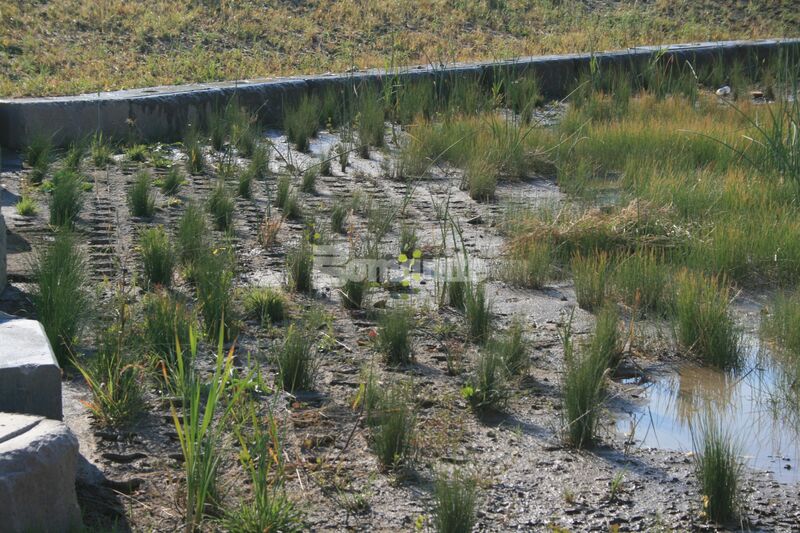 This detention pond is not just a muddy pit in the ground, as is often the case. The formers used for Grasscrete pervious concrete are made from recycled pulp paper, are 100 percent biodegradable, and slowly started to dissolve as soon as the pour started. Despite being a durable pavement, the Grasscrete system results in 37.5 percent surface and effective void, meaning almost a third of the entire surface was open and was planted. This vegetation coverage of the concrete is truly remarkable. The concrete has an integral color of light brown to blend with the natural surroundings and virtually disappears. Despite the routine necessity of scraping the detention pond, in a matter of a very short time, everything is back to normal. Or should we say, back to nature, thanks to Grasscrete.